Object change notification can be used to notify an application when an object is updated or added to a bucket. Note that this feature is separate from Cloud Pub/Sub Notifications for Cloud Storage. Cloud Pub/Sub Notifications are the recommended way to track changes to objects in your Cloud Storage buckets because they're faster, more flexible, easier to set up, and more cost-effective. A client application can send a request to watch for changes to the objects in a particular bucket. Completing a watch request creates a new notification channel. A notification channel is the means by which a notification message is sent to an application watching a bucket. Only one type of notification channel, a web hook, is currently supported. After a notification channel is initiated, Cloud Storage notifies the application any time an object is added, updated, or removed from the bucket. For example, when you add a new picture to a bucket, an application could be notified to create a thumbnail. The figure below shows an example data flow for an application that processes change notifications. Any application server that can receive HTTPS POST requests can be used to process change notifications. Note: Object change notification API methods are not supported by the XML API. Application URL The URL of your application. This is the address where notifications will be sent. Note that this must be an HTTPS URL; HTTP URLs are not permitted. Channel Identifier The identifier for a notification channel. Must be unique within a particular bucket, i.e., if there are multiple notification channels for a single bucket, each notification channel must have a distinct channel identifier. This identifier will be sent to your application along with each notification message. Resource Identifier An opaque identifier for the resource being watched. The resource identifier is required for stopping a notification channel. You can retrieve this identifier from the response to a watch request or from the X-Goog-Resource-Id header of notification event messages. Client Token (optional) Client tokens can be used to validate notifications events. To do this, set a custom client token with your watch request. Notification messages will contain this token so you can verify that they are authentic. This will create a notification channel that sends notification events to the given application URL for the given bucket. The notification channel will include the custom client token and channel identifier if specified. For more information on this command, run the command gsutil help notification watchbucket. Note: To use the notification command with gsutil, you must use a service account for authorization. See Notification Authorization for more details. Note: The resource and channel identifiers are required for stopping a notification channel, so make sure you save a persistent copy of these values. They will also be present in the body of notification event messages. When watching a bucket, the notification channel being created will be associated with the Google Cloud Platform Console project of the application initiating the API request. This means, for example, that if a user gives access to an installed application or web application via an OAuth2 flow, a notification channel created by the application will be associated with the application's project, not the project containing the bucket being watched. Since a service account is associated with a project, using a service account to watch a bucket will create a notification channel in the service account's project. You should use an existing service account or create a new one, and download the associated private key. To configure gsutil to use the service account, you can use the Google Cloud SDK to add the service account as a credentialed account for working with Google Cloud Platform resources, including Object change notification. After adding the credentials, all subsequent gsutil commands will use the service account credentials. Use the gcloud auth activate-service-account command, and specify service account email address and private key. service-account-email is the service account email address. It will look something like this: 1234567890123-abcdefghijklmonpqrstuvwxz01234567@developer.gserviceaccount.com. path/to/key.p12 is the key you were prompted to download when you created the service account. If you lost the key, you can return to the Credentials page in the Google Cloud Platform Console and generate a new key. Confirm that the service account is the active credentialed account. You should see active by the service account credentials. Now, any gsutil object notification commands you run use the service account credentials. Watch requests will only succeed if the notification URL is a domain whitelisted by the notification channel's project. Verify that you own the domain by using the Search Console verification process. In the GCP Console, go to the Domain verification tab on the Credentials page. In the Configure webhook notifications dialog, enter the domain to verify. The domain must be registered in the Search Console with an https:// URL or have been verified with the Domain name provider verification method. 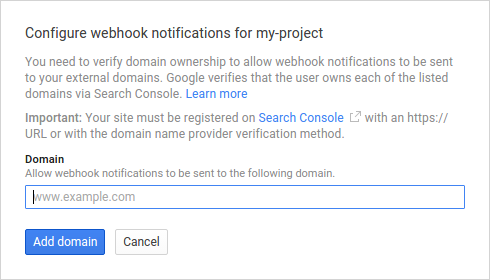 Make sure you are either an owner or editor for the GCP Console project (see Project members and permissions) and you are a site owner of the domain that will receive notifications. If you are not a site owner of the domain, contact the domain owner to get added as a verified owner (see Add or remove owners). You can use the Google API Explorer for Webmaster Tools to list sites on the domain, and in particular, see if the domain's siteUrl property starts with https://. This will stop all notification events to the specified resource identifier and channel identifier pair. Additional active channels for the same resource will be unaffected. The resource and channel identifiers can be found in the response of a watch request or in the body of notification event messages. For more information on this command, run the command gsutil help notification stopchannel. A notification event is sent when a new notification channel is created after issuing a watch request. After receiving the sync event, all later changes to the bucket will be sent to the application URL configured for the channel. A notification event is sent when a new object is added to a bucket, an existing object's content or metadata has been modified, or an object is deleted from a bucket. exists - for object additions and updates. not_exists - for object deletions. and where the contents of the JSON message contain the current representation of the object as described at Object Resource Description. If a notification delivery attempt fails, additional attempts will be made. The interval between additional delivery attempts is determined by an exponential backoff algorithm that starts with a retry 30 seconds after the initial failure. Subsequent deliveries are attempted at increasing intervals, up to a maximum interval of 90 minutes. Note that the subsequent retry intervals are slightly randomized so they do not occur at exact exponential values. After the maximum retry interval of 90 minutes is reached, subsequent retries continue every 90 minutes for 7 days. If the notification cannot be delivered in that time, it is purged. Any other HTTP response codes returned by your application are treated as permanent failures and are not retried. Note: Because of the retry mechanism above, it is possible that notifications are delivered more than once. Ensure that your application is idempotent with respect to processing a unique notification. You can can do this by choosing a combination of notification headers to help uniquely identify notifications, including X-Goog-Channel-Id, X-Goog-Resource-Id, X-Goog-Resource-State, X-Goog-Generation, and X-Goog-Metageneration. This section explains how to create an App Engine client application which processes change notification events. The example application contains a class called MainPage. When the user updates or adds an object to the bucket, the MainPage class processes the notification event. For simplicity, the post method that does the actual processing just logs a message with the time the notification was received. You can replace this code with your actual processing logic. If you are not yet comfortable developing App Engine applications, please try deploying a sample app or following a tutorial before you continue on. Create the configuration file app.yaml to specify the client application that handles the bucket's change notification events. """Notification handling for Google Cloud Storage.""" notification message in the log. # it with your own notification processing code. Assigning the application's access permission to the bucket. Start watching the bucket for object changes. where ApplicationUrl is the URL of your App Engine application, e.g., https://ApplicationId.appspot.com/. If you used your own domain name to deploy the application, use it instead of appspot.com in the previous command. Go to the Logging page for your project. Refresh the list of the logged messages, if needed. Verify that the log message issued by the application is logged. Cloud Storage notifies the application, which then logs a message. Go to the Logging page for your project. Refresh the list of the logged messages and find the message for the object copy. Remove the notification channel by specifying the channel and resource identifiers returned when you issued the notification command to watch the bucket.